This Bass Pro Shop is near the Silverton Casino on the outskirts of Las Vegas coming in from California. The penny machine is on the ground floor across from the aquarium. The token machine is next to the penny machine. Store hours are: Monday through Saturday 9:00 am to 9:00 pm, Sunday 9:00 am to 7:00 pm. Closed Christmas day. Plenty of free parking. 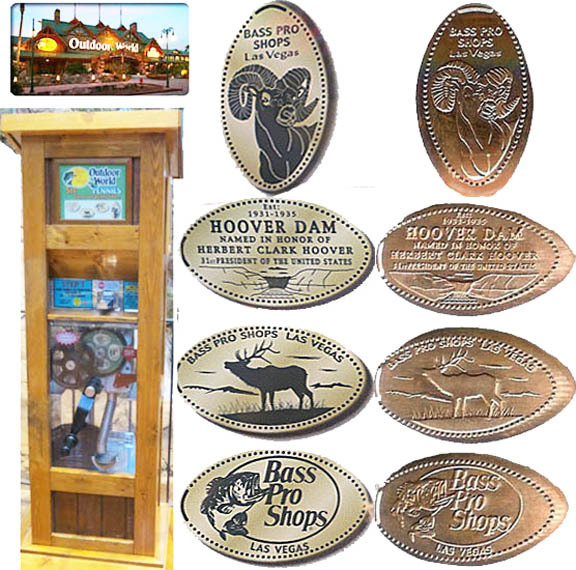 Even though there is a PennyCollector Las Vegas penny book in the machine, they do not sell the books and will not open the machine to sell that book. 1. (V) Bighorn Sheep with Bass Pro Shops Las Vegas . 2. (H) Hoover Dam with Est. 1931-1935, HOOVER DAM, named in honor of Herbert Clark Hoover, 31st president of the United States . 3. (H) Large antler Elk with Bass Pro Shops Las Vegas .